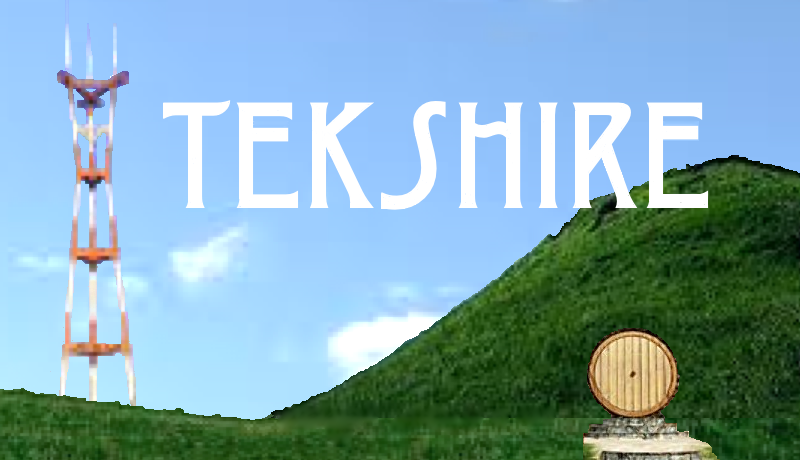 The company that became TekShire was founded in 1992. At that time, QuickTime, Apple's consumer video software for personal computers, was a hot topic. We joined the fun by beginning to build a video editor for individuals. Based on that, we named the company IndiVideo. Our icon was the silhouette of an individual with a video device embedded within his chest. At the same time Adobe launched Premiere, their video editor. We were blown away at how good their interface was and that they had implemented features we hadn't even thought of. Rather than compete, we began to search for another area of specialization. 1992 seems to have been a very good year for founding companies. That was the year that Palm Computing also started. They had their first device on the market by 1996. Shortly thereafter, our CTO bought two Palm Pilot 5000's and announced, "Now we have to program for these." By virtue of having a checking account and registered domain name, IndiVideo became the name of our shareware company. The company produced a line of games and utilities; mostly for Palm devices, but also for PC's and an ill fated venture into WinCE. A summary of our best known products can be found on our Palm products page . We wanted the name to suggest "mobile" or "tech" and found that using the more Germanic spelling of "Tek" gave us a better chance of finding a new name that had not been registered by someone already. We tried quite a few combinations of other words to come up with a unique name. Finally in keeping with the number of places that tried to cash in on the cachet of Silicon Valley by naming their high tech areas such as the Silicon Desert, Silicon Forest, Silicon Glen, and Silicon Ally, we opted for the geographical description that best fit where our founder grew up: the Shire. Thus was born TekShire. When we wanted to come up with a company logo, the first idea was that a hill with a round door to indicate a Hobbit hole was the best way to suggest the Shire. Then we needed something to represent technology for the Tek part of the name. A radio tower was one of the better ideas to get that technological flavor in. Sutro Tower, which we could see from our San Francisco apartment, looked like the radio tower you would find in Mordor. Combining the two concepts gave us our logo as displayed in the banner at the top of this web page. Disclaimer: The image above was created by an engineer. While our media consultant did have some suggestions for improvement, she did basically bless what we are currently using with the faint praise that it "wasn't bad for an engineer." Hopefully the rest of our products won't be bad either.